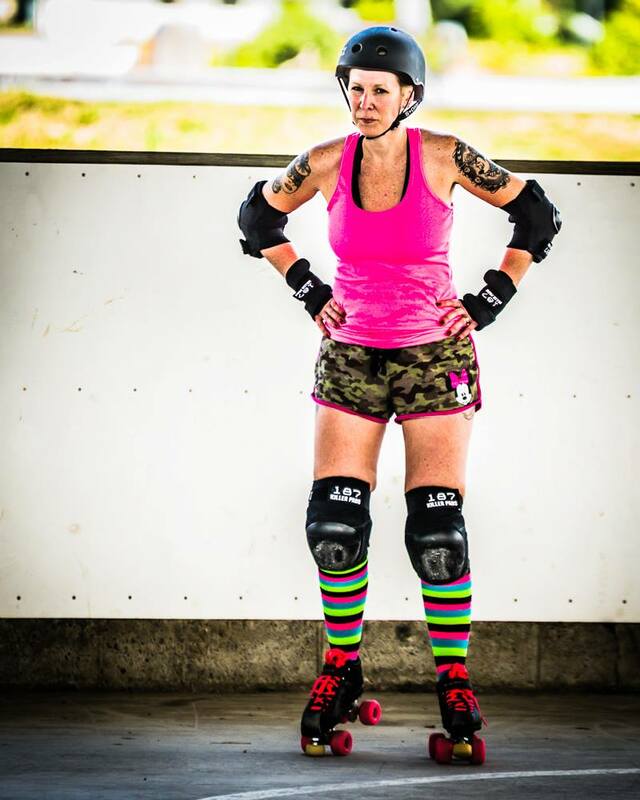 Is Roller Derby my mid life crisis? I don’t think so but many people have asked me that since I joined a roller derby league last May. Well then why did I join roller derby? I’ve asked myself that many times since I started and there are many reasons but I always seem to focus on one. If I hadn’t tried it I would always have wondered if I could have done it. I’m a big believer in trying new things and living for today. When I’m old I want to look back on life and remember all that I’ve done and accomplished instead of looking back and regretting what I never tried. I’m certainly not the youngest player on the team but neither am I the oldest. My “derby sisters” as I now affectionately call them range in age from 18 to 57 so at 41 I guess I’m sort of in the middle. Our group ranges in abilities as well as age. We have a few girls that may take 2 years to pass their minimum skill requirements to compete in a bout and a few that look like there were born on roller skates. I must point out that the better roller skaters did have what I would call an advantage as they were all either hockey players or figure skaters for many years. Whether young or old, athletic or not this diverse group of women have been supportive and encouraging and become like family to me. Roller derby happened in a time of my life when I was trying to get healthy and active so when a friend of my husband’s starting talking to him about being a referee for the league it got me to thinking about playing. I’d started running a few months prior and felt I was in pretty decent shape so transitioning to the activity level of roller derby shouldn’t be that hard, or so I thought. Ha Ha, I could not have been more wrong. The muscles you use for running are very different than the muscles you use for derby. After my first few practices I had muscles that hurt where I didn’t even know I had muscles and I was totally exhausted after just a half hour of the two or three hour long practices. 8 months later I’ve gained so much strength and endurance that some days it still amazes me how far I’ve come. Along with the healthy aspects I must admit there was a bit of me that thought I could finally be one of the cool kids. All through high school I was the quiet, shy, book worm that was dubbed the “pastel princess” because of the clothes I wore. In recent years my shyness has definitely receded and I was gradually becoming more confident but I still saw myself as reserved and boring with few friends. This was my chance to totally break out of that shell and be the funky clothes wearing, bold, outgoing woman that I knew was buried inside me. Roller derby is a competitive sport that is seeing a huge resurgence in popularity. It is not what people think it is from watching movies like “Whip It”. There is no fighting and intentional injuring of other skaters, but let me tell you what there is: hard work, dedication and hours and hours of training. I train 5 hours a week and skate any chance I can outside of practice. 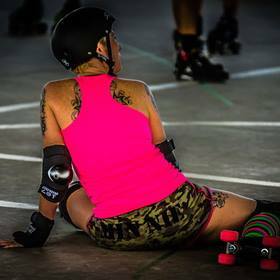 I’m a derby girl and proud of it. So was joining roller derby my mid life crisis? No way! A crisis is a negative event and roller derby has been anything but. It has been (and hopefully will continue to be for a long time) an amazing adventure that has brought me a new awareness of myself, confidence and a lot of incredible new friends. Lisa when I first heard about your new activity, roller derby, I was surprised, but thought it was kind of neat. As the months have progressed and I have watched your triumphs, the happiness and power it gives you is just amazing! To me it looks like you have found a real love, a real passion and I am so happy for you!! Congratulations!! I do love it (almost as much as Disney) and it truly is an empowering activity for me. Thank you and I’m grateful to have you and so many other strong empowering derby women still in my life even though I’ve stepped back from it for a bit.